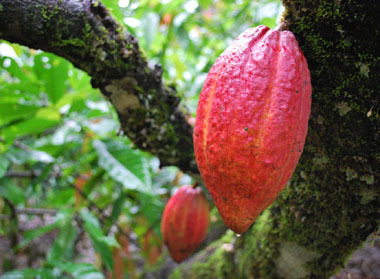 Chocolate comes from the cacao tree, which produce cocoa pods that grow around their trunks, not on the branches. The cocoa belt is about 15 degrees north and south of the equator, so places like Africa, South America, Central America, Indonesia and Asia are where cacao trees grow. Farmers take these pods, slice them in half and scrape the beans from the middle. They then sandwich them between layers of banana leaves to ferment, for approximately two to nine days, where they begin to take on color and flavor. After fermentation, the beans are placed on wooden boards or bamboo mats to dry in the hot sun for up to 14 days. Once dried, the beans are packed into bags and shipped of to cocoa processors, all over the world, where they will be made into chocolate. 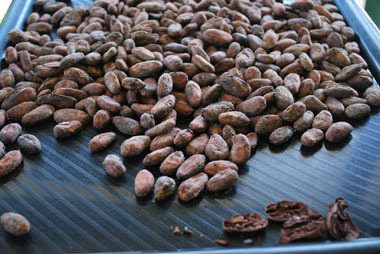 Once they receive the beans, cocoa processors will wash and roast them. Roasting helps enhance the flavors of the beans and it also helps to loosen their tough, papery shells. The actual bean inside is naturally segmented and will fall apart into small pieces call cocoa nibs. Nibs are basically raw chocolate. The nibs are placed under tons of pressure (literally) which will press out the vegetable fat, which we call cocoa butter. Cocoa butter is a key ingredient in all chocolate and what gives chocolate its smooth, creamy consistency. What's left over once the cocoa butter is pressed out is called cocoa mass. This is the other main ingredient in chocolate, which gives it its smell, color and flavor. Cocoa mass is very bitter. Once these two main ingredients are separated, they are then recombined in different proportions with other ingredients like milk and sugar to make three different types of chocolate. Combining cocoa butter, cocoa mass and sugar creates dark chocolate; cocoa butter, cocoa mass, sugar and milk creates milk chocolate and cocoa butter, sugar and milk creates white chocolate. Now comes the fun part– tasting the chocolate! 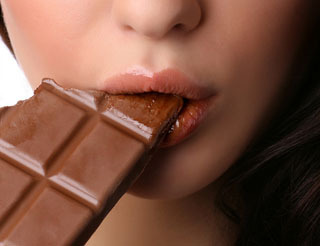 Slow down when eating chocolate to recognize the different flavors as it melts in your mouth. Sweet, sour, salt and bitter cannot be smelled. Usually when someone says something smells sweet, they are really smelling vanilla. How can you tell if chocolate is good or bad? - Quick melt (chocolate melts at body temperature, the moment you put it in your mouth). A quick melt is desirable. 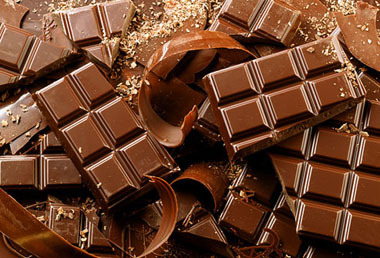 - Bitter is not necessarily a negative attribute in chocolate, especially in dark chocolate. It can be positive when talking about coffee, tea or fruits. Sometimes it may be hard to identify exactly what flavors you are experiencing as you eat a piece of chocolate. Here are some common terms used when tasting chocolate. Once again, there are similarities to what we taste in wine. Study the look and color of the chocolate. If tempered, it should have a smooth, high sheen look. If grey/white, then the chocolate has bloomed – the fats or sugars have migrated to the surface of the chocolate leaving a whitish residue. This is due to a change in humidity or temperature. Smell the broken piece. Identify the fragrances. Milk chocolate may have a milky, vanilla smell. Remember that you cannot smell sweet. Dark chocolate may have more of a chocolate aroma. Unfermented beans smell like burnt rubber. Beans stored in humid areas can smell like grass or burlap. Beans dried over wood fires smell smoky. How does the chocolate feel in your mouth? Quick melt or slow melt? Smooth or chalky? DON'T REFRIGERATE! Chocolates absorb odors very easily. Also, excessive moisture in the fridge can cause sugar bloom, meaning the sugar rises to the surface, causing discoloration. Chocolates need a cool, dry place away from sunlight and strong odors. When chocolates are kept at a consistent temperature less than 70°F with humidity less than 55% (same as my wine storage), the cocoa solids and cocoa butter emulsion will stay stable for months. Solid milk chocolates will last nine months and dark chocolates will last for a year. Filled chocolates, such as truffles, will last about four months. If you need to keep chocolates for a longer period of time, freeze them in an airtight container. When you're ready to eat them, allow them to thaw inside the container before enjoying. Opening the container before they thaw will expose them to the air and cause them to bloom and/or perspire. Always eat chocolate at room temperature, especially truffles. Use the same theory when pairing food with wine. Lightly flavored foods with lighter-bodied wines and fuller flavored foods with full-bodied wines. The stronger the chocolate, the more full-bodied the wine. 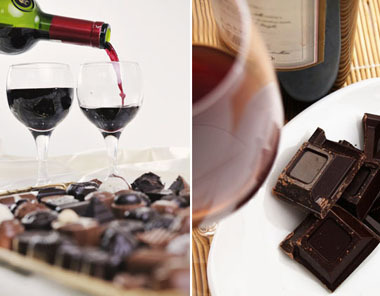 Lighter-bodied wines with lighter flavored chocolates. Seek wines that have the same flavor profile as the chocolate or occasionally look for wines that contrast the chocolate flavors, just for a different experience. Dark chocolate is usually 50%-75% cacao and has strong complex flavors with nuances that are nutty, spicy, floral, earthy, and has a balanced aftertaste that is not too sweet. Considering these flavor profiles, dark chocolate pairs well with full-bodied red wines: such as a Cabernet Sauvignon (including Bordeaux), which highlight the fruity and peppery notes in the chocolate, or a Zinfandel, which brings out the chocolate's spicy subtleties. Tawny or Vintage Port also complements truffles or dark chocolate desserts. A bar of milk chocolate, with its milder, sweeter flavors, could be matched with a light-bodied Merlot or Pinot Noir. Match dessert wines or sparkling wines, including Champagne, with mild milk chocolates, and especially strawberries dipped in milk chocolate- yummy! A Ruby or Tawny Port also works. Has sweet flavor notes including vanilla, caramel and cream. Moscato is very popular these days, whether it be the still or sparkling varieties. Since the white chocolate tends to be buttery in flavor, try a Sherry as a match. Enjoy the sweetness of Rieslings and the spiciness of Gewürztraminer to match the honey flavors of white chocolate. On the coldest of winter nights, add a little spice to the chocolate selection by including chili-infused chocolates. The extra kick of cayenne and cinnamon in this chocolate will match well with a fruity, fortified red wine, such as a Ruby Port. You can balance the heat with a little sweet. Options are endless when it comes to choosing a chocolate covered caramel. The buttery caramel with a touch of natural sea salt pairs well with wines such as a Hungarian Tokaji or a dry Oloroso Sherry. These wines both have a fruity and nutty bouquet, which complement the caramel. If these are included on the pairings plate, be sure to have a back-up supply. Guests won't be able to eat just one of these irresistible sweet-and-salty confections. The saltiness of the nuts marry well with a medium dry sherry, which is slightly sweet, and will accent the sweetness from the chocolate. As you can tell, there is no one single correct way to create a chocolate and wine pairing. And with a little help from your favorite wine shop, the possibilities are endless. This Irish powerhouse is fantastic with the dark bitterness of a high-cacao chocolate. The bitter notes are balanced by that hint of sweetness from the whiskey. It is pure happiness. All the new-American-oak flavors clash a little with dark chocolate, but with milk chocolate it makes the spice in the rye explode. All the rich sherry-cask notes that come through in this Highland malt pair wonderfully with the almonds and rich creaminess of the milk chocolate. Oak does not overwhelm this Scotch, so it allows for the hints of fruit to come through. Those notes, combined with the high proof of the spirit and the spicy bitterness of the chocolate, are an intensely cheeky experience. A salted truffle perfectly complements the notes of the sea and peat smoke in the Bowmore. And the sweet nutty chocolate loves the sherry-cask flavor. This bourbon actually pairs well with many of the chocolates above, but one cannot always enjoy only fancy confections. The peanuts and caramel react beautifully to the aged whiskey.